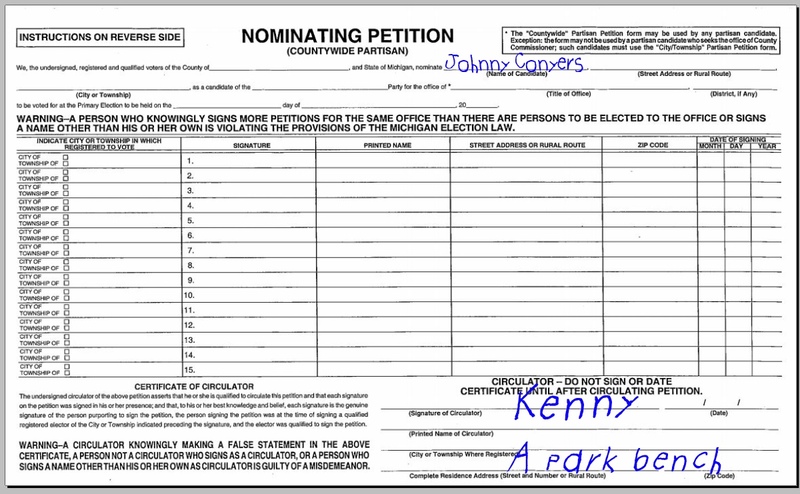 Should The Judiciary Throw Away Michigan's Signature Gathering Standards Entirely? It Seems Ken Braun Thinks So. By now most folks have heard that a federal judge has given John Conyer’s congressional career a new lease on life. ” .. the free speech rights of Conyers and the circulators were harmed, an argument pressed by the American Civil Liberties Union of Michigan. There’s evidence that the failure to comply with the law was a “result of good-faith mistakes and that (circulators) believed they were in compliance with the statute,” the judge said. Good faith? or lied to, in order to get those signatures? For all anyone might know, the gatherers could have been foreign nationals or illegals. Requirements are made to prevent such things, yet the judiciary can falsely apply first amendment violations on simple verification of whom they might be? Verifications carefully considered, (and not held to as strictly as 2008, I might add) and part of reasonable election law. Why heck, legislators can now simply ‘guess’ at what regulations are to be acceptable by the courts. Certainly it will vary, based on the personality of the judge, and his or her ability to properly interpret the constitution. Troubling even more however, is the same judge which can invalidate any number of standards for petition gathering cannot provide a defined list of acceptable standards; even if asked. That would be legislating from the bench, and an improper role. Article 1, Section 4 of the United States Constitution, is pretty clear. There isn’t a judge who can alter that. Not a single one. Why wouldn’t those signature gatherers already be registered? Could it be they are illegal immigrants? Perhaps they are foreign nationals? Maybe the gatherers are only adolescent? Perhaps they were zombies. There is no way to verify such things if the court suspends through writ, the ability of the state to compare through qualified voting records whom those persons might actually be. Fair enough. And I am in support of political participation as mentioned in the preceding paragraphs. And frankly, going to the logical end of Ken Braun’s premise, why should anyone be registered to vote (or sign a petition) in the first place? Certainly, if the undocumented signature collector has standing to represent the voters, the validation of the signatures themselves might as well be made up as well. Certainly, immigrants who are here illegally have an interest in how our government is run too. And heck, I certainly lean libertarian sometimes, but.. . The bottom line is there must be SOME expected standard, or we might as well give elections away to the greatest manipulators of the system. Even Rose Bogaert in 2008 did not argue in favor of NO STANDARDS. The judge in that case entered a similar determination on constitutionality of being registered, but the greater number of signatures tossed was never tested and became moot. In fact the defendant (Land) was only ordered to examine the signatures of the 2053 signatures held out from validation. There were several thousand more that were rejected offhand for unexplained reasons. The point is however, why would we bother assuming one person-one-vote might still survive when a court can render a perfectly reasonable standard (being an interested and legally verifiable elector) to be unreasonable? while he is confounded by Russell Kirk’s indefatigable logic. He would contradict his other assertions. So it is easier for him to remain incomplete in his analysis of what is appropriate. If he pretends a standard that is ‘acceptable,’ his premise of “order” in the Kirk reference is out of line. It appears that NO order is appropriate for Braun, as he pillories those who are steadfast in principle and standard. His prior (and ongoing personal) attacks on a Republican committeeman, for that man’s commitment to human decency and mores, are a perfect example. And now promulgating false comparisons of common rules to government control over the individual? His assertions should be rejected offhand. If the difference made was of registered voters from other districts collecting signatures, then I agree wholeheartedly with the 2008 decision, as it recognizes the effect on interested parties who are legally and veritably engaged in the electoral process. Its similarity with regard to Leitman’s judicial activism, is only there by the fact SOME of the same issues existed. The recent decision by U.S. District Judge Matthew Leitman simply deteriorates rule-of-law and the ability of Michigan’s self rule under article 1 section 4 of the US Constitution. Confusion provided by both the Judge Matthew Leitman in his decision, AND by pundit Ken Braun in his defense of minor anarchy, does little service to lawful government. It seems now that the most simple rules can no longer be reliable indicators of equal application under the law.